Before Tesla, there was Porsche! A girl can hardly say "electric sports car" without some Tesla product popping up in her thought balloon. But the best sports car in the world has already been made, sorry, by Porsche - the 911. So, since you can't improve on perfection, why not electrify it? Paul Liddle from World Class Exotics based in West Palm Beach, Florida, has been doing exactly that. 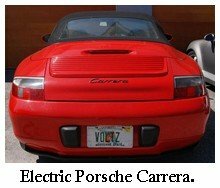 He converts sports cars like this Porsche Carrera and the Lamborghini Diablo into high-end, performance-oriented electric sports cars, and he found you can build your dream EV for a lot less than the 100K price tag of the Tesla. Me: You convert a variety of cars to electric, don't you? I see a bunch of high-end performance vehicles on the CoolGreenCar website, and then a couple of serious exotics, but also bus conversions and EMIS hybrids, too. What was your first conversion, and when? Paul: 8 years ago, a 911 with my 959 conversion body. I have been dealing with Porsches and driving daily since 1986. 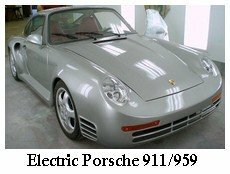 For those who don't speak Porsche: The 959 was a supercar that Porsche built on the framework of the 911. Sort of a limited edition car; Jay Leno might have one, but they're quite rare. For those of us who are not lucky enough to own one of these amazing Porsche supercars, there's a body kit you can buy that will turn a 911 - there are plenty of those around! - into a 959. 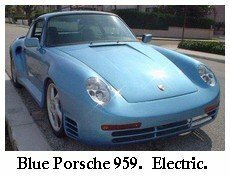 Me: It seems like those electric sports car conversions, the Porsches, could be termed "performance cars" based on your choice of components. Did you initially build your electric sports cars to race? Paul: I've raced at several tracks. The cars I convert can be made as race cars or daily drivers. Me: Is there a difference of how you build them for daily driving, or for racing? I'm wondering, how do you get 100 miles out of an electric sports car? Paul: The lead acids go more like 50 miles in a Porsche. 100 miles is with a 32 kwh pack of lithium iron phosphate. Me: I thought you were using lithium polymer batteries. Paul: We are using LiFeP04 now. We built the first lithium Porsche with the Li-Po, but since then changed over. Me: I see that you're offering two-motor conversions. Interesting! A lot of people have been asking me about that. How are they controlled? Paul: Either with a Zilla, or 2 controllers with 2 pots for 2 motors. Me: The 911 you converted that's called the Blue One? That's got a Kostov 11" motor. Compared to the Warfield/NetGain motors you've installed more recently, how do you like it? Is it still performing well? Paul: That car is sold, but generally there are not any problems with any of the motors, they just go and don't need servicing for a very long time. Me: You've kept the Porsche drive train in most of those conversions. How is it holding up? I suppose the Porsche drive train might be more tolerant of the combination of DC series wound motor, plenty of amps, and lead feet than some cars' drive trains. Paul: The Porsche transaxle is strong! Me: It had better be, huh? Paul: I haven't had any failures as of yet. Me: Do you do any direct-drive conversions, or is it better to keep the existing transmission for an electric sports car, or what? Another question I get a lot is about in-wheel motors. Paul: We mostly use Porsche transaxles but have done direct drive several times. In wheel motors are awesome, just expensive; $20k each. Me: Ouch. Do you do any AC conversions for electric sports cars? Paul: We are going to be trying 3 manufacturers. 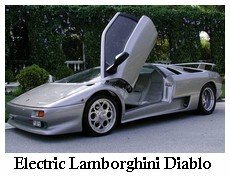 Me: What was the most exotic car you've ever converted to electric? Me: Did you go with direct drive on the Lamborghini Diablo? There isn't any drive train info on the EV Photo Album page. Paul: No. That's because I lost my hard drive after the Diablo. I've got other pictures of the car, but none of the motor mounted. We customized the interior to have a custom third seat in the middle when we got rid of the gas tank from the middle, and then used that area to strengthen the chassis. Update: Paul has moved on to other projects and is no longer doing these electric sports car conversions.